Elephants are one of the most socially organized animals but with some uniqueness! Like us, elephants too exhibit family groups and clans but, unlike us, social lives of male and female elephants are completely different. Female elephants spend their lifetime in highly bonded matrilineal family groups (this also contains calves irrespective of their gender), whereas adult male elephants spend solitary lives or in association with other males in small groups. Amidst this gender differentiation, calves always share protective space well fortified by adult elephants of the herd. 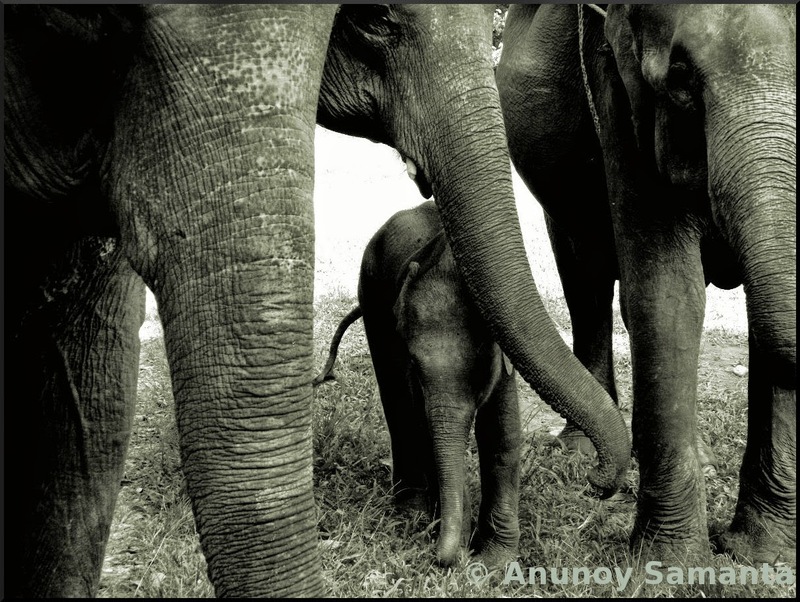 Possessiveness over their calves is quite evident in the behavior of adult elephants in a group. Elephants know how to pamper their kids, I feel. Excellent click. Black and white style is adding value to the picture without altering the mood. Superb! Cute ..where did you click it ? North Bengal ?